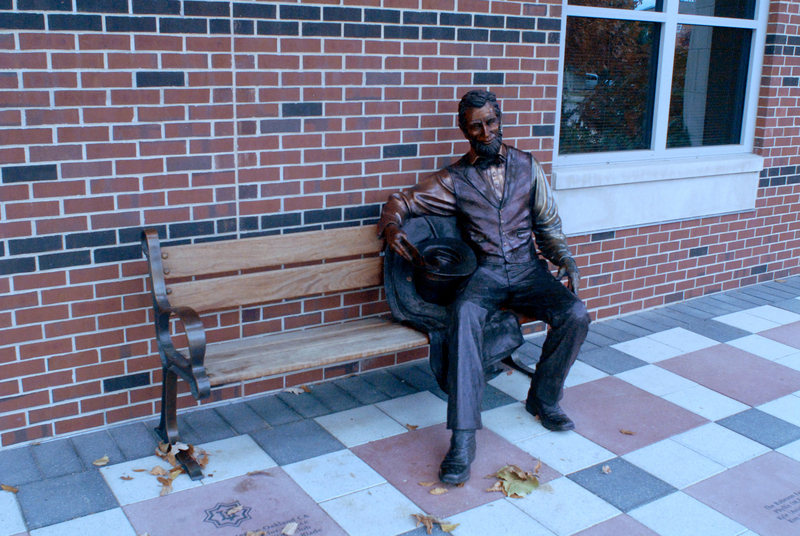 The "Lincoln" sculpture was created by Mark Lundeen in 2012. The bronze sculpture spans 18"x10"x14" in front of the Alice Campbell Alumni Center entrance. 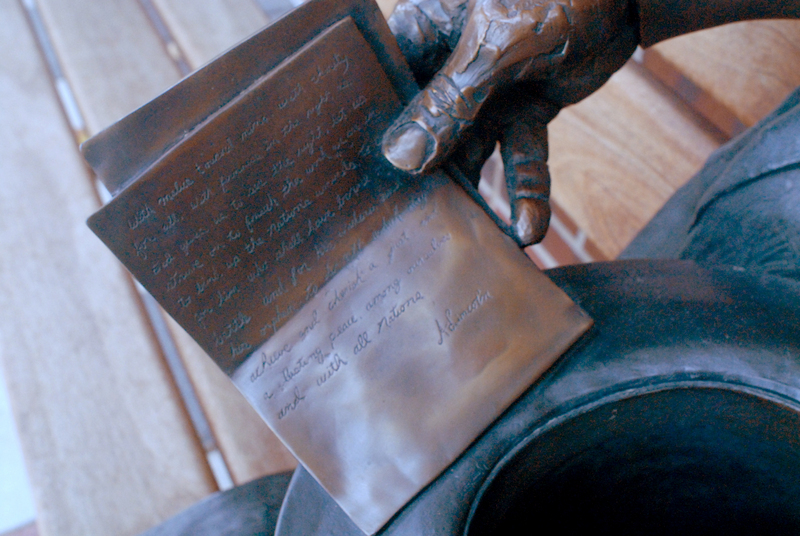 In the Fall of 2013, visitors to the University of Illinois Urbana-Champaign may have noticed a new face outside the east entrance of the Alice Campbell Alumni Center: A life sized bronze sculpture of sixteenth president and longtime Illinois resident Abraham Lincoln sits comfortably on a bench holding notes from the last paragraph of his 1865 second inaugural address. The sculpture was created by Colorado based artist Mark Lundeen, who's brother, George, created the statue of Harold "Red" Grange located on the west side of Memorial Stadium. "Lincoln" was obtained and donated by Gail Kellogg, a class of 1965 U of I graduate. Inspired by the newly renovated Lincoln Hall on a campus visit in the Fall of 2012, Kellogg thought [regarding donating the sculpture] "What are you waiting for" (1)? 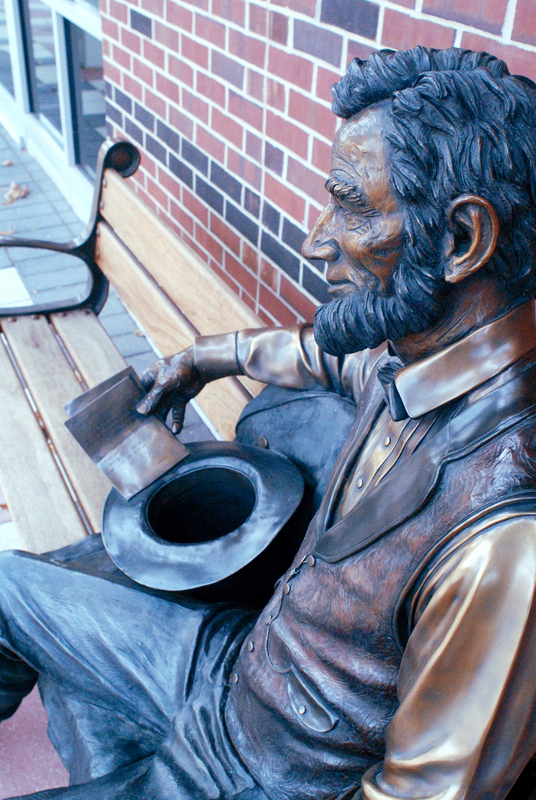 A long-time supporter of scholarships and other activities in the College of Liberal Arts and Sciences, Kellogg hopes that the sculpture "will pique people’s interest in Abraham Lincoln, his writings, and all he said and did" and that "people find it wonderful and fun. I hope they sit on the bench with him, take pictures with their kids, and enjoy interacting with it" (1). "With malice toward none; with charity for all; with firmness in the right, as God gives us to see the right, let us strive on to finish the work we are in, to bind up the nation's wounds; to care for him who shall have borne the battle, and for his widow and his orphan, to do all which may achieve and cherish a just, and a lasting peace, among ourselves and all nations" (2). Visitors to Springfield, Illinois can see an identical sculpture in southwest corner of Union Park. The Springfield "Lincoln" was installed in 2006 (3). Sarah Christensen, “Lincoln,” ExploreCU, accessed April 21, 2019, https://explorecu.org/items/show/265.